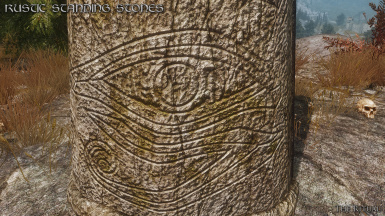 A rustic retexture of the 13 Standing Stones (or Birthstones) found in Skyrim. 2K and 1K versions available. 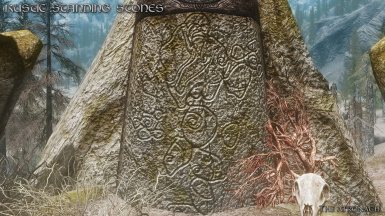 Do not use any of the Standing Stone textures without my permission. The ruinsdoorextra01 textures belong to raiserfx, and require his permission. The mossdirtpile01 and ridgedstone08 textures belong to gizmomzig, and required his permission. 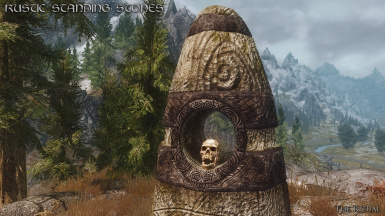 Bethesda for creating Skyrim and giving mod authors the permission and tools to modify their game. 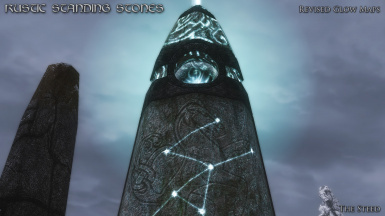 Nexus for providing a great showcase and forum for mod authors to share their work. raiserfx for his ruinsdoorextra01 textures. gizmomzing for his mossdirtpile01 and ridgedstone08 textures. CG Textures for their great resource of photographic imagery. 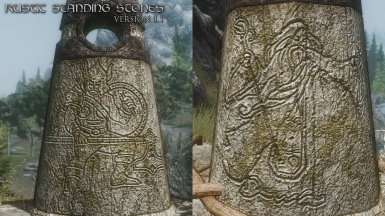 this update makes the carvings easier to see, with enhanced shading and ambient occlusion, so they should be more readable, even at lower resolutions. 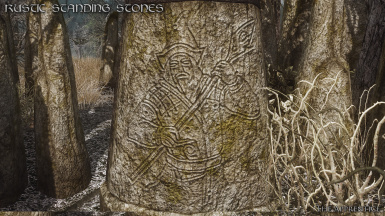 Some people thought the rustic nature of the textures made it harder to make out the carved figures, so this version should alleviate that issue. 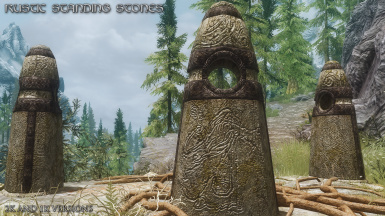 RUSTIC STANDING STONES retextures the thirteen Standing Stones (or birthstones) found in Skyrim. 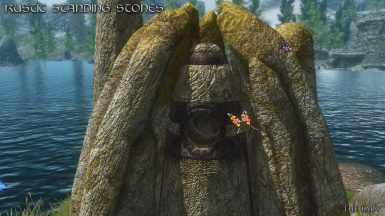 I was never happy with the appearance of the vanilla textures, as they looked too smooth and not at all like the ancient magical artifacts that they represented. This mod aims to remedy that situation. 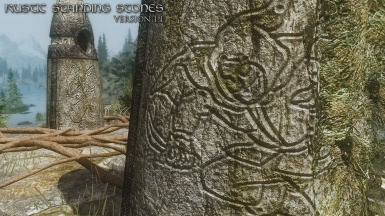 UPDATE: Version 1.1 makes the carvings easier to see, with enhanced shading and ambient occlusion, so they should be more readable, even at lower resolutions. 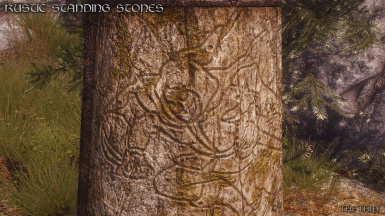 Some people thought the rustic nature of the textures made it harder to make out the carved figures, so this version should help alleviate that issue. 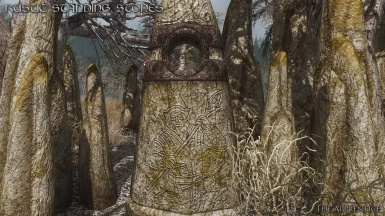 The Guardian Stones (Wizard, Warrior, and Thief) are the first real magical artifacts you come upon in the vanilla game, and their appearance was always disappointing to me. 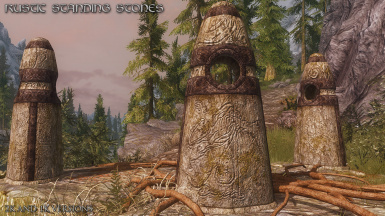 The Standing Stones (which grant their powers to travelers who choose to accept their divine gift), must be some of the oldest artifacts found in Skyrim. Therefore, they would've experienced countless seasons of rain, freezing, and thawing. Their surface should show considerable weathering. 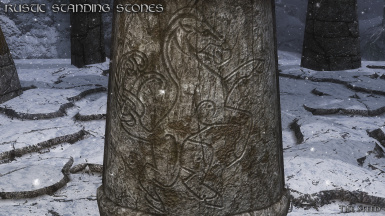 The vanilla stones are smooth and blurry, with figures that appear as if they were clay carved with a putty knife, not chiseled from hard stone. 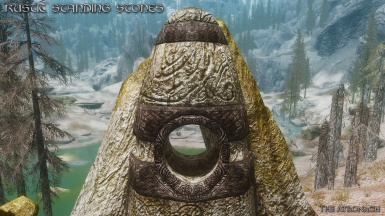 In my retextures, I revised the stone to show cracks and fissures that would occur naturally from the harsh Skyrim weather. 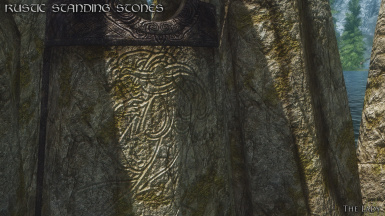 The level of detail of the rock textures is now much greater than the original, especially in the 2K version. 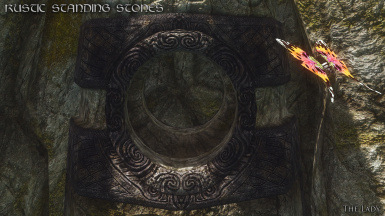 Instead of a green smear, the moss on the surface has more detail and depth. 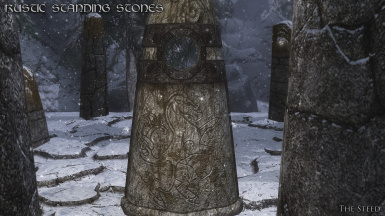 The Standing Stones in the coldest regions have a brown lichen instead of the green moss, due to the frigid conditions. I completely revised the glow maps, so they no longer look like a child's connect the dots drawings. 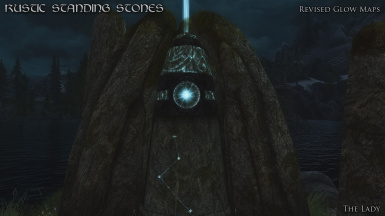 The power of the stones comes from Aetherius, the realm of magic. 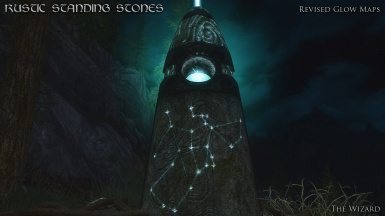 The "birthstones" carved figures represent Skyrim's constellations, as the starlight itself is magical in nature. 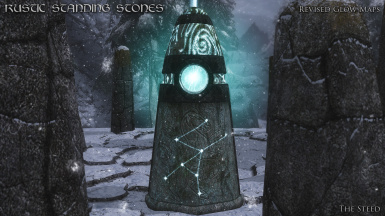 The Standing Stones (through unknown means), tap into the magical starlight and channel it directly into the stones. 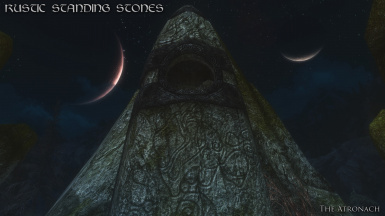 This magical energy infuses the stones with their blessings. 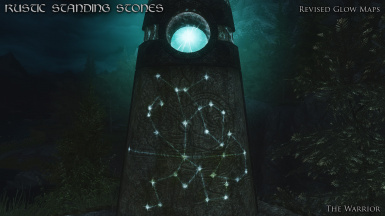 I changed the dots of the vanilla glow maps to stars, since that is what they were meant to represent. I made the connecting lines more subdued, so the stars would be predominant. 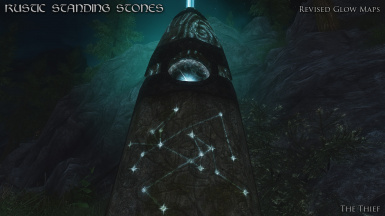 I also added a subtle amount of glow that leaks through the cracks in the stone. My intention was to make the glow effect both more detailed and more magical in feeling. Thanks to mikie1001421 for the lovely animated Gif. 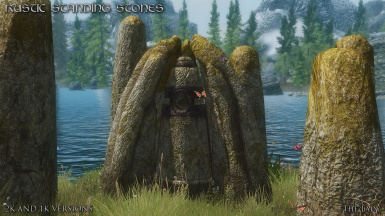 Besides the main Standing Stones textures, there are also a few textures that are shared from the dungeons, including the ridgestone08 textures and the mossdirtpile textures. 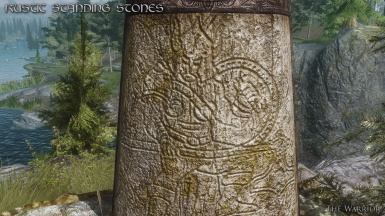 There's also the metal insert at the top of the stone, the ruinsdoorextra01 textures. 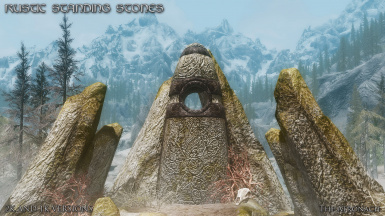 For these dungeon textures, I decided it was best to work from some already established mods that did excellent jobs with these textures (and stayed true to the original Bethesda design). 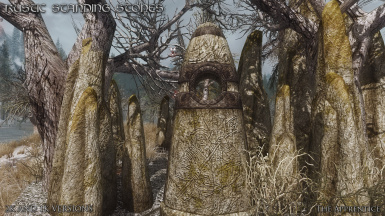 For the ruinsdoorextra01 metal textures, I got permission from raiserfx to use his textures from his popular Ruins Clutter Improved mod. I gave the metal texture more wear and added more details to the normal map. 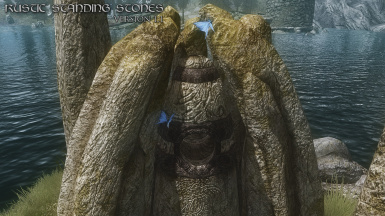 For the other two dungeons textures, I got permission from gizmomzig to use his Re-Defined Dungeons mod as a base for my retextures. Sorry to be longwinded, but I like to give my rationale for why I decided to make a particular retexture in the first place, and my reasons for making them the way that I did. 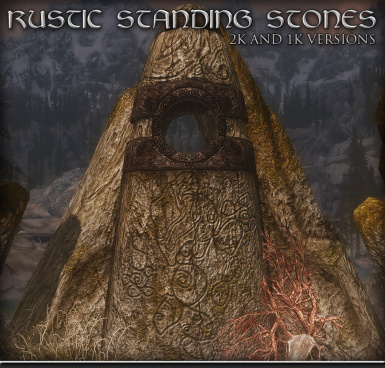 I hope people enjoy this new addition to my rustic series of retextures for Skyrim. 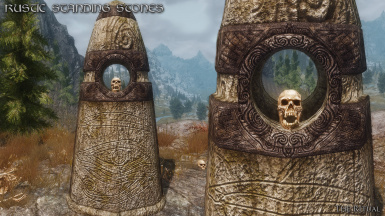 As is true for the majority of my mods, this particular mod is just a simple texture replacer. No meshes or ESP files are involved. 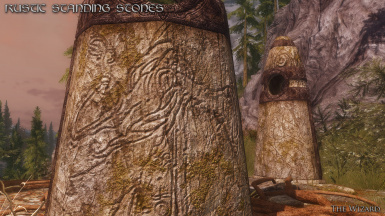 It is simply a matter of overwriting any textures that you may already have installed in your game that are in common. 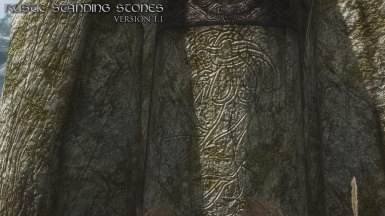 There are 48 textures in all... 42 in the "clutter" folder (3 for each of the 13 standing stones, and 3 for the scrollworktrim). 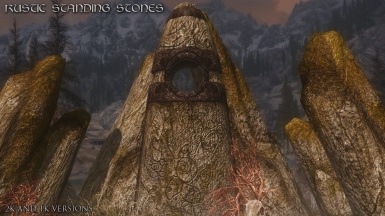 The other 6 are in the "dungeons" folder... 2 for the mossdirtpile01, 2 for ridgestone08, and the 2 for ruinsdoorextra01, which are located in the "nordic" folder within. 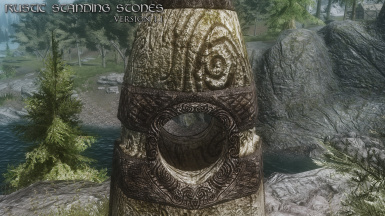 If you have any "conflicts" with other mods, just make sure to load my textures after them. Simple.